Swansea - "Still the best place"
Dylan's 'Ugly-lovely town' remained a staple part of his life until his untimely death. It was the place that he always returned, the place he knew as home. The sights and smells of his sea-town filled him full of creativity and witnessed the most creative period of his life. Born and raised in the comfortable middle class surroundings of the Uplands area he was not your natural born 'bohemian.' The young Dylan picked up a pencil and began to write, meticulous in his craft he produced nearly 2/3rds of the material that make up his published works. Creating works that would impact the global literary scene from the snug confines of his "bedroom by the boiler" at 5 Cwmdonkin Drive. All this by the time he was just 23! A young man who enjoyed exploring his surroundings, walking and taking the tram into the heart of town to meet like minded modern thinkers and creatives such as Alfred Janes, Charlie Fisher, Tom Warner, Mervyn Levy, Mably Owen, John Ormond, Dan Jones, Bert Trick and Vernon Watkins amongst others.They would talk of everything and anything encouraging each other to succeed in their chosen field. Pre war Swansea was a place of wonderment for Dylan, a product of the prestigious grammar school and former editor of its magazine he became a junior cub reporter on the local newspaper at 17 and lasted a mere 18 months in the job that he never wanted. He wanted to write poetry not reports. His time working on the newspaper helped open his eyes to his depression hit hometown. He saw the nitty gritty of working class life and hardship giving him yet more material to draw upon. He would venture into the depths of the wild, Gower countryside, it's beautiful landscapes capturing his imagination whilst also treading the boards as an amateur player with the Swansea Little Theatre and proudly displaying exuberant teenage antics in the pubs of Mumbles. He was as his friend and mentor Bert Trick exclaimed - "The Eternal Swansea Boy"
The starting point for anyone with an interest in Dylan Thomas.The restored birthplace of the man himself. Enjoy a fully guided tour talking of Dylan's life and works. He spent 23 years living at the address and created a near 2/3rds of what became his published works there. Houses the 'Love the Words' exhibition looking at Dylan's life and works as well as a small gift and coffee shop. "a world within the world of the sea town"
Laugharne - "the strangest town in Wales"
This little England in the heart of Welsh speaking west Wales was first mentioned by Dylan in a letter he wrote on Whit Monday 1934 in what is believed to be his first visit. Its "sane disregard for haste" and cast of characters with many quirks on the banks of the Taf estuary instantly appealed to him. The author Richard Hughes lived in the town at the grand 'Castle House' and was often visited by Dylan and the Welsh painter Augustus John. Dylan would take a small fisherman's cottage on Gosport Street as his first marital home with wife Caitlin Macnamara in the May of 1938. 'Eros' was small and damp and the couple would soon move 'Sea View' a grand 3 storey house that Augustus John described as looking like a 'doll's house.' They would live here with little possessions and a baby son (Llewelyn) until the start of the war. In that time Dylan drew on the material created in his youthful notebooks and recollections of his beloved Swansea and Llansteffan, producing 'The Map of Love' 'The World I Breathe' (his first American collection) and his prose piece 'Portrait of the Artist as a Young Dog.' When war finally reached his "little Danzig" the writer's disposition was one of great unease. His love of writing and visits to the always hospitable Brown's Hotel would be interrupted by the horror of war. The well known pacifist sought work outside of combat and due to failing an army medical was free to pursue work that would keep him as an active writer. The couple moved from Laugharne and Dylan took up work with Strand films in London creating propaganda scripts. They would return to visit the town sporadically and to settle debts over the course of the preceding years until Dylan's benefactor Margaret Taylor acquired the romantic looking Boathouse for the family in 1949. It was here that Dylan continued work on a project that had gestated in him over many years since a seventeen year old in Swansea. The piece would eventually become 'Under Milk Wood.' Embarking on a series of gruelling American tours meant that he was away from the town more than he was in it during his final four years. A simple white cross marks the final resting place of the 'Rimbaud of Cwmdonkin Drive' in the churchyard of St. Martin's. Dylan's wife Caitlin is also interred with him at this spot. 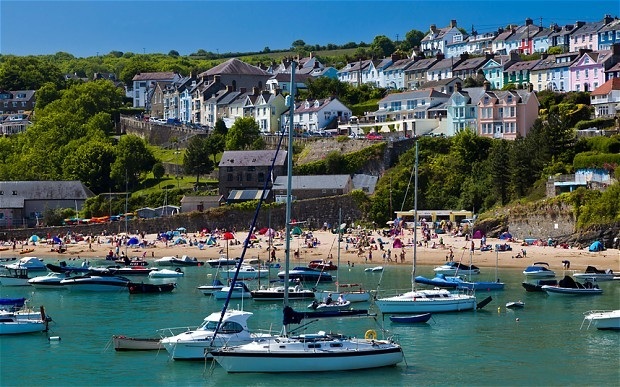 'A cliff perched town at the far end of Wales' is how Dylan described New Quay, the beautiful harboured fishing village along the mid west coast of Wales. He had been visiting the area in which it lies (Ceredigion) for many years dating back to the 1930s before his eventual stay and second creative 'flowering' in the mid 1940s. The area became a retreat for Dylan during the war years, far from the devastation of his London offices and digs that he was inhabiting. A more peaceful and serene and indeed beautiful setting for a writer to focus his energies. It was first to Talsarn, 'Plas Gelli' that Dylan and Caitlin took upon the hospitality of Vera Killick nee Phillips, an old Swansea friend of Dylan's (one of the few females to infiltrate the 'Kardomah gang' ocassionally.) Vera's Swansea roots lay a stones throw from Dylan's own at Cwmdonkin Drive and much of her family also hailed from Llansteffan and Llangain. They also stayed at the small village of Talgarreg for a short time. The area was described by Dylan as 'the most precious place in the world.' and enjoyed writing beneath an apple tree in the grounds of Plas Gelli. Running through places associated with the poet, this beautiful trail is marked by blue plaques and information boards in Lampeter, Aberaeron and New Quay. There is also a detailed guide available, The Dylan Thomas Trail, which helps you walk the route but also describes the poet’s time in the area. The trail begins on the coast at the Central Hotel in Llanon, then meanders through upland countryside to Plas Gelli, Talsarn, the mansion where Dylan and Caitlin lived for part of WWII. It continues to Lampeter, before turning west to wander along the beautifulAeron valley. The walk passes Tyglyn Aeron (now a hotel) which was the summer home of the publisher, Geoffrey Faber – T. S. Eliot spent holidays here in the 1930s. The trail then continues past the National Trust’s Llanerchaeron estate until it reaches Aberaeron on the coast of Cardigan Bay. From here, it runs along the cliffs to New Quay, where Dylan and family lived in 1944-45. The trail runs through Plas Llanina, once the home of Lord Howard de Walden, who encouraged Dylan to write in the mansion’s apple house. Next comes Majoda, the tiny bungalow where Dylan and family lived through one of the coldest winters on record (the field next door was used to build the set for the film, The Edge of Love). The trail then follows the beach, before it arrives in New Quay, its finishing point. There are further day walks on extensions of the trail, including Eli Jenkins' Pub Walk which starts and finishes at the Crown in nearby Llwyndafydd.